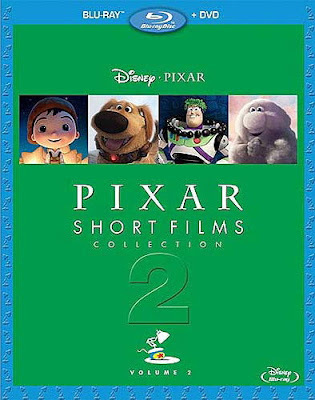 By now we know that each Pixar release will faithfully feature an animated short prior to the start of the feature - and in the spirit of those short films, Pixar has announced Pixar Short Films Collection Volume 2 - due out November 13, 2012. For the Birds (May 1, 2000) - Released with Monsters, Inc. In addition to the short films, the DVD also included bonus features - Pixar Short: Short History (click link to read our review) is a 20-minute feature that highlights a brief history of how Pixar used the short films to help them guide their path. UPDATED October 15, 2012 - For the official list of shorts that will be included in the release, read our updated post here. The list below was our original predictions. The list above is what we believe will be the set of shorts included on the Blu Ray/DVD (since the list has not been officially announced yet). We're also speculating that The Legend of Mor'Du will not make it onto the disc...why? Because when Volume 1 was released, it came out the exact same day as Ratatouille and it didn't include Your Friend the Rat. Since Volume 2 will be released the same day as Brave, we think this Blu Ray will follow suit and not include the The Legend of Mor'Du which will be on the Brave release. For Pixar fans, this release will not disappoint - click the link below to pre-order Volume 2 (link with no photo shown at this point), or to order Volume 1 as well. Also - keep in mind that Chronicle Books released The Art of Pixar Short Films in 2009 that corresponds exactly with the shorts included in the Volume 1 Blu Ray/DVD release. Consider it a companion guide to learn everything about the included shorts. Keep in mind that this book is out of print so some prices can be quite steep at times (just watch the prices and buy it when the price is right). Since the Volume 2 shorts disc comes out the same day as Brave - don't forget to pre-order your copy of Brave as well.